This article is intended as a helpful guide and shows how I fitted a spray bar. If you are in any doubt, or not qualified, do not undertake this work, consult a qualified mechanic. The author or the GT4 Drivers Club can not be held responsible for any loss or damage resulting from use of this article. Why fit a spray bar? This idea for this modification came from a system which was fitted to the ST205 World Rally Car. The road-going ST205WRC had the components of the spray bar present but deactivated. The role of the spray bar is to spray water onto the charge cooler radiator mounted at the front of the car, when this water evaporates it takes some of the heat away from the coolant flowing inside the radiator. This coolant is then circulated back to the charge cooler where being colder it is able to remove more heat from the inlet charge. Many of the current crop of rally cars use a spray bar system and the Mitsubishi Evolution 8 road car comes fitted with a working spray bar. The spray bar fitted to the ST205WRC is based on 3 nozzles mounted inside the front bumper cover. These nozzles are quite crude and project a jet of water similar to a windscreen washer. I do not believe this is the most effective design due to the area covered by the water and the volumes used. If the water was projected as a true spray the fine droplets produced would be more efficient at removing heat. 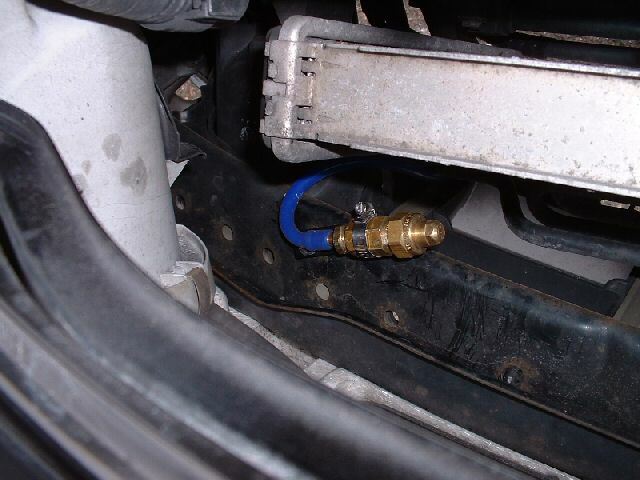 Several web sites on the internet mention that some WRC owners have activated the stock spray bar by connecting a switch and fitting a tank - however I have never seen or heard from anyone directly who has done this. Part of the problem of running a WRC style spray bar on a road car is the quantity of water involved - the WRC cars used somewhere in the region of 1 litre per mile on the special stages, the tanks were frequently larger than 35 litres. 35kgs of extra weight is no small matter in a car that's already on the heavier side of things. With this in mind I chose to develop my spray bar system as a means to combat heat soak and improve reliability by generally keeping things a bit cooler, rather than a direct performance enhancing modification. A basic set of tools plus a vice for bending the bracket and crimpers for the electrical connections. The nozzles come with an integral filter and as shown can be disassembled for cleaning. The nozzles were positioned on the inside of the bumper cover. On both sides there is a small 6mm stud protruding upwards - using a small strip of aluminium strip, a nut and a jubilee clip, the nozzles are fixed into position. This is quite difficult as access is limited and there is not much room for turning spanners etc. I assembled the strip/clip and nozzle off the car then bolted it into place. This location has the added benefit that it requires no drilling of the cars panels and positions the nozzle just outside the radiator, I decided this was a good idea as in a minor collision the weighty nozzles could easily damage the radiator if it was positioned directly in front of it, the chosen mounting point keeps the nozzle out of the way. I used standard Samco vacuum hose for the tubing. This is long lasting and very flexible, some effort was required to get the hose onto the larger diameter nozzles, but a little hot water solved the issue. Any standard washer bottle pump should be sufficient for use in a road / trackday application, providing that it can flow a reasonable quantity of water. I bought my pump from www.autospeed.com at the same time as my nozzles for convenience, I later tested the system with a VDO washer pump and had similar results. It has been suggested that the pump from the headlight washers could be used. This is a possibility but it creates a few potential problems - firstly only the UK cars have headlight washers, secondly the headlight washers will not function anymore, thirdly it will be washer fluid that is sprayed onto the radiator. On the flip side you will not have to worry about fitting a separate tank for the spray bar fluid. The tank presented the most difficulties during the design / installation. The engine bay of the ST205 is not particularly spacious and finding a suitable location proved difficult. If your car does not have ABS then the space near the power steering reservoir is a possibility, this was not an option for me as my car has ABS fitted. The tank I chose is available from Demon Tweeks part number MXP127. I had to be rather inventive with the positioning of the tank, the bracket shown in the above pictures allowed me to mount the tank securely to a pre-existing bolt hole on the inner wing. The bracket is made from Aluminium strip purchased from B&Q. This picture shows the tank installed. 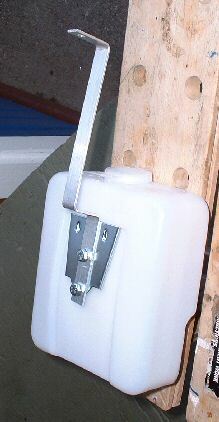 Filling of the tank is slightly awkward but the lid can be opened and shut with one hand from above, a funnel with a piece of tube attached is used. I decided to try something a little more adventurous here and have dual activation for the spray bar. I wanted to have the ability to switch the spray bar on at will, but I also wanted some form of automated spraying. www.autospeed.com sell a spray controller device which works using fuzzy logic - looking at how you are driving and activating the system where it will be most effective. Whilst this looks like a decent piece of kit, I decided it was probably more suited to the 35 litre capacity systems rather than my small setup. The route I chose, while not ideal, is to have the spray activated via the boost. To do this I sourced a pressure switch similar to the type found in the ERL Aquamist water injection systems. Wiring supplies, switches, fuses, I obtained from www.vehicle-wiring-products.co.uk a company I found excellent to deal with. 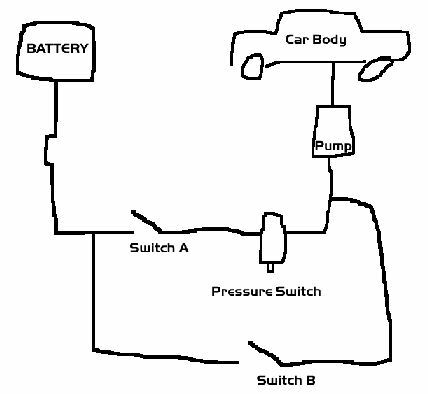 My wiring diagram is below. Please forgive the crudeness of it. Switch A and B are actually housed within the same unit a 3 position rocker switch, the following options are available - off - on with boost - on permanently. I have found the system to be reliable, however the tank of water does not last very long. I have chosen to run the system on de-ionized water rather than tap water as I do not want deposits being left on the radiator after the water has evaporated (this is a common problem on commercial air conditioning systems which run spray bars). In the winter some methanol is added to the tank to prevent the system from freezing. I have not as yet taken any readings of temperature to see if the system is effective, once I have devised a suitable method to examine the temperatures I will list the results. 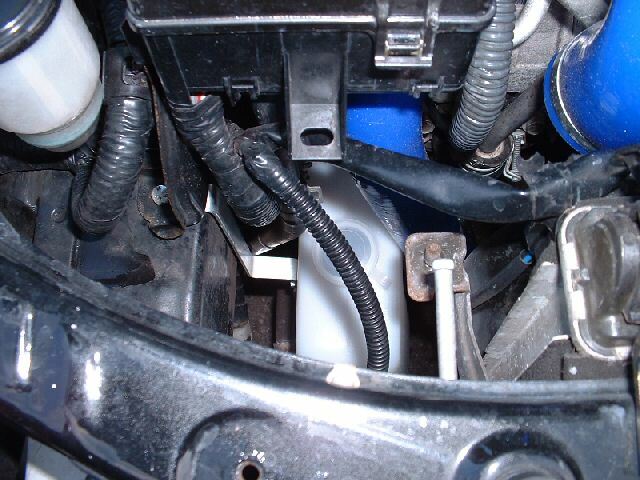 In February 2005 I installed a temperature sensor in the coolant return from the charge cooler top box. This allows me to see the maximum temperature that the coolant reaches. I have found that typically the fluid's temperature is between 20 and 25 degrees C even after long periods in traffic although clearly this depends on the ambient temperature. On several trackdays I have seen temperatures of over 45C. Disappointingly the spray bar only has a slight impact on these temperatures when on track around 2-4C reduction in temperature in approximately 60 seconds of running. On the road the results are much worse with little or no discernable impact on the temperatures. I believe this is mainly to do with the limited quantity of water available - certainly a bigger tank could be installed but would the benefits be greater than the weight penalty - unlikely. To sum up for people using the stock charge cooler setup - activating the existing spray bar on the homologation cars, or fitting a custom one would appear have no significant benefits, I believe this system would have a much greater impact when used in conjunction with a front mounted air to air intercooler.